This critical review is the follow up of two feature articles titled Geopolymers based on natural and synthetic metakaolin, (on line on 17 January 2016) and Environmental implications of Geopolymers, (online on 20 June 2015). It has been written in compliance with a decision of Elsevier and Geopolymer Institute to join forces, distill and distribute the best research publications contained in their combined archives, through a series of Elsevier-Geopolymer Institute Virtual Special Issues on Geopolymer Science. On line 29 June 2015. The invention of mineral geopolymers of the types poly(sialate) -Si-O-Al-O- (Si:Al=1), poly(sialate-siloxo) -Si-O-Al-O-Si-O- (Si:Al=2), poly(sialate-disiloxo) -Si-O-Al-O-Si-O-Si-O- (Si:Al=3), poly(sialate-multisiloxo) (Si:Al>>3) goes back to 1972, when, in the aftermath of various catastrophic fires in France causing hundreds of casualties in public buildings which involved common organic plastic, research on non-flammable and non-combustible plastic materials became our priority. We founded a private research company in 1972, Cordi SA (called later Cordi-Géopolymère), to develop new inorganic fire-resistant polymer materials which we called «geopolymers» (mineral polymers resulting from geochemistry or geosynthesis). We knew that we would not reach fire resistance and zero toxicity with organic chemistry. When, ten years later, we started the development of a geopolymer matrix composite concept, the objective was to fabricate molding tools and patterns, to replace metal tooling for small production runs in the plastic processing industry and the foundry industry. The targeted working temperatures were in the range of 200 to 350 °C. Later on, the demand for higher operational temperatures required better performances up to 800 °C. See our paper Davidovits and Davidovics (1991) titled Geopolymer: Ultra-High Temperature Tooling Material For The Manufacture Of Advanced Composites. It describes the development of tooling techniques involving geopolymer matrices of the poly(sialate-disiloxo) type (-Si-O-Al-Si-O-Si-O-). These first geopolymer composite-tooling and geopolymer castable-tooling offered direct replication, on-site construction capabilities and very short cure-cycle. They enabled product designers and tool makers to envisage the use of ceramic type materials with the same facility as organic polymers. Geopolymer composite and castable tooling have been fabricated and were in use, processing organic APC-2 thermoplastic materials as well as PMR-15 polyimides. This paper was written 25 years ago. It is probably the most relevant paper of that period, even today. Indeed, the majority of geopolymer matrices studied and developed recently are similar to those already in use at that time. This paper is available at the Geopolymer Institute Library as Technical Paper #9: Ultra-High Temperature Tooling Material for the Manufacture of Advanced Composites at http://www.geopolymer.org/category/library/technical-papers/. The present special issue, acknowledging the scarcity of publications on reinforced geopolymer-composites, tries to collect the best of the scientific production for the understanding of geopolymer resins, binders / cement and reinforcement fiber properties. Chapter 21 of the book Geopolymer Chemistry and Applications is titled Geopolymer-fiber composites and focuses exclusively on the development of high-performance geopolymer matrices for fire and heat-resistant fiber-composite materials (see Figure 1). : unidirectional fiber tapes, 0/90°fabrics, fiber mats are impregnated with a geopolymer resin. : individual fibers (0.5% to 20% volume) are added to geopolymer binders, cements and concretes. 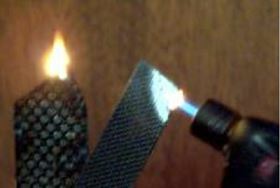 Figure 2: An epoxy-carbon-composite (left) is burning while a geopolymer-carbon-composite (right) still resists a 1200 °C fire. Figure 3: Predicted time to flashover in ISO 9705 corner/room fire test with various structural composites as wall materials, after Lyon et al. (1997). In applications that require more than 200 °C temperature exposure, most organic matrix composites cannot be used. In contrast, geopolymer fiber-composites are characterized by their ease of production at low temperature and their resistance to high temperatures. In the past, these qualities were irreconcilable. The ease of production could be found only in organic plastic materials; resistance to temperature was the characteristic property of ceramics; mechanical strength was obtained with composite materials. Geopolymer-fiber-composites reconcile these three properties. They can be transformed at low temperatures, between 20 °C and 180 °C with the same technologies as for organic plastics; the presence of high-performance ceramic fibers confers excellent mechanical properties over a very wide temperature range. Figure 2 illustrates the behavior of organic (here epoxy) and geopolymer matrices, with respect to resistance to fire. The problem of fire resistance was addressed in the 1990s when we started the development of fire resistant panels for aircraft cabin interiors, initiated by Lyon (1994, 1995) at the American Federal Aviation Administration (FAA). When a plane crash-lands and catches fire, half the people who survive the impact may not get out in time. That is because the plastics in the cabin—the seat cushions, carpeting, walls and luggage bins—are combustible. And when they burn, they give off flammable gases that, in two minutes, can explode into a fireball. The main objective of the FAA project was summarized in a short sentence: " Giving Survivors More Time to Escape" . It involved three partners: the Civil Engineering Department of Rutgers University, USA. (P. Balaguru) in charge of the making of the geopolymer/carbon fiber composite, the Fire Section of FAA, Atlantic City, USA (R. Lyon, 1997), where the testing was performed, and our company Cordi-Géopolymère, Saint-Quentin, France which supplied the geopolymer resins. The geopolymer matrix was of the poly(sialate-multisiloxo) type with a ratio Si:Al in the range of 18 to 35 [it is also called K-nano-poly(sialate)]. The results were published by Lyon et al. (1997) in a paper titled Properties of Geopolymer Matrix-Carbon Fiber Composites. 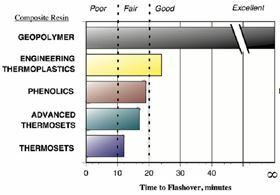 In Figure 3, the flashover performances of the geopolymer/carbon fiber composite were compared with those of the organic polymer matrices currently in use, such as: thermoset (vinylester, epoxy), advanced thermoset (BMI, PI), phenolic, and engineering thermoplastic (PPS, PEEK). Flashover is a phenomenon unique to compartment fires where incomplete combustion products accumulate at the ceiling and ignite causing total involvement of the compartment materials and signaling the end to human survivability. Consequently, in a compartment fire the time to flashover is the time available for escape and this is the single most important factor in determining the fire hazard of a material or set of materials in a compartment fire. The Federal Aviation Administration has used the time-to-flashover of materials in aircraft cabin tests as the basis for a heat release and heat release rate acceptance criteria for cabin materials for commercial aircraft. The engineering thermoplastics are predicted not to reach flashover during the 20-minute ignition period but could generate appreciable smoke, while the Geopolymer composite will never ignite, reach flashover, or generate any smoke in a compartment fire. The present selection of papers dedicated to fire resistant Geopolymer-fiber composites, acknowledging the scarcity of the number of publications, begins with the previously cited R. Lyon et al. (1997) Properties of Geopolymer Matrix-Carbon Fiber Composites. It is available at the Geopolymer Institute Library as Technical Paper # 1 Fire resistant aluminosilicate composites at http://www.geopolymer.org/category/library/technical-papers/. It compares Geopolymer/Carbon-fiber composites to organic matrix composites being used for infrastructure and transportation applications. At irradiance levels of 50 kW/m2 typical of the heat flux in a well-developed fire, glass- or carbon-reinforced polyester, vinylester, epoxy, bismaleimide, cyanate ester, polyimide, phenolic, and engineering thermoplastic laminates ignited readily and released appreciable heat and smoke, while carbon-fiber reinforced geopolymer composites did not ignite, burn, or release any smoke even after extended heat flux exposure. The carbon fiber composite retains sixty-three percent of its original flexural strength after a simulated large fire exposure: 154 MPa at 800 °C compared to 245 MPa at room temperature. This paper was written almost 20 years ago. It is probably the most relevant paper of that period, even as it only scratches the surface of this still largely unexplored research topic. Another paper by the same group was published in 2000 (Hammel et al., 2000). It is titled Strength retention of fire resistant aluminosilicate–carbon composites under wet–dry conditions. By far, carbon and glass fibers are the most popular fiber reinforcements for composites. Traditional carbon composites are relatively expensive whereas E-glass fabrics are approximately one order of magnitude less expensive than similar carbon fabrics. Hammell et al. (1998, 1999) presented a very interested solution in their paper titled, Influence of reinforcement types on the flexural properties of Geopolymer composites. See also Geopolymer’99 Proceedings, pages 155–164. They studied the case when carbon layers are alternating with E-glass fabrics. We know that samples made using only E-glass fabric exhibit almost linear elastic behavior up to failure, and the failure is brittle and the stress five times lower than with carbon, 110 MPa instead of 525 MPa for unidirectional fibers. This confirms that the bond between matrix and E-Glass is strong, and that the plate is acting as a homogeneous element. The S-glass plate exhibits less ductility than the carbon plates, but proved to be much more ductile than the E-glass composite. When alternating layers of E-glass and carbon are used, the reduction in strength is minimal. E-glass seemed to bond well with the matrix, providing a good interlaminar plate between carbon layers. Addition of E-glass layers increases the deflection at failure of the plate, which increased energy absorption before failure. However, there is a more brittle post peak loss of strength with these combined fabric plates. Since the elastic modulus of glass is much lower than carbon, the flexural modulus of these plates is lower than plain carbon plates. The Carbon/E-glass sample’s stiffness is lower but the strength is similar to plain Carbon (504 MPa vs. 525 MPa). The results presented herein can dictate future studies to optimize hybrid performance and to achieve economical configurations for a given set of design requirements. The same group applied these carbon-glass hybrids in the fire protection of balsa panels in Giancaspro et al. (2004), Fire protection of flammable materials utilizing geopolymer. For many years, sandwich structures have been utilized throughout the aerospace and shipbuilding industry. One of the efficient configurations of sandwich structures is fiber reinforced polymer (FRP) facings laminated onto a balsa-wood core. This configuration provides both high specific strength and high specific stiffness. The major disadvantage of this system is the flammability of the organic polymers used for binding the fiber facings to the balsa wood core. In this study, two layers of a geopolymer woven carbon and glass fabric were applied to the balsa core. The results indicate that a 2 mm layer of the Geopolymer-fiber coating is more than sufficient to meet the Federal Aviation Administration fire requirements. During the FAA research project, the team at Rutgers University (P. Balaguru et al., 1997) started an experimental investigation on the behavior of reinforced Portland cement concrete beams strengthened with carbon fiber fabrics and geopolymer. The paper titled Geopolymer-Carbon Composite for Repair and Rehabilitation of Reinforced Concrete Beams, is available at the Geopolymer Institute Library Technical paper #2 Reinforced Concrete Beams, 1997, http://www.geopolymer.org/library/technical-papers/2-reinforced-concrete-beams/. The primary objective of the investigation was to determine whether geopolymer can be used instead of organic polymers for fastening the carbon fabrics to concrete. Four reinforced concrete beams that were similar to the ones reinforced with carbon fabrics and organic adhesives were tested. The beams had 0, 2, 3 and 5 layers of unidirectional carbon fabrics attached at the tension face of the beams. The results indicate that poly(sialate-multisiloxo) geopolymer provides excellent adhesion both to concrete surface and in the interlaminar planes of fabrics. All three beams failed by tearing of fabrics. This is very significant because very few researchers report failure of beams with tearing of fabrics. The most common failure pattern reported in the literature is the failure by delamination of fabrics at the interface of concrete and fabrics. Hence it can be stated that this particular geopolymer matrix provides as good or better adhesion in comparison with organic polymers. In addition, geopolymer is fire-resistant, does not degrade under UV light, and is chemically compatible with concrete. Therefore, the product could be successfully developed for use in the repair and retrofitting of concrete structures. The research group also applied the same technology for the strengthening of masonry walls. See the paper by Nazier et al. (2002), titled Strengthening of masonry walls with high strength fibers and inorganic matrix. Suitable geopolymer products can, in general, be subjected to a flame from 100 to 1400 °C without any appreciable change occurring in their properties. A mineral geopolymer is by essence "fire-resistant". But this does not reflect the notion of "heat resistance". It cannot be sufficiently emphasized how difficult it is to give an accurate definition of "heat resistance" for high-tech geopolymer products. These difficulties reside, on the one hand, in the definition of the term itself, and, on the other hand, in the wide range of variation in geopolymers. Generally, people do not make the difference between a product that does not burn, the essence of all mineral geopolymers, and a heat-resistant artifact. The heat resistance of a material is a function, in the first place, of at least two parameters—the temperature and the time. An exact specification of heat resistance should therefore include information on how long material can be heated at a given temperature without variation of its properties. A recent paper by the well-known racing cars manufacturer McLaren, UK, Mills-Brown et al. (2013) titled The development of a high temperature tensile testing rig for composite laminates, stresses the exceptional properties of a geopolymer matrix of the poly(sialate) type. This study aimed to develop a high temperature tensile test capable of testing fiber reinforced composites up to 1000 °C, in order to understand the behavior of certain composites at these temperatures and produce data suitable in the design of high temperature structures (mechanical strength as well as emission and toxicity). It is the combination of the right poly(sialate-multisiloxo) geopolymer matrix with SiC fibers, which provides these exceptional heat resistance results. Heat resistance at temperature higher than 1000 °C cannot be reached with the geopolymer matrix of the type poly(sialate-multisiloxo). Dechang Jia and his team at Harbin Institute of Technology, China, used the property of heat-treated K–PS poly(sialate) and K–PSS poly(sialate-siloxo) matrices . They crystallize into high temperature stable minerals: kalsilite KAlSiO4 and leucite KAlSi2O6. Their paper (He et al., 2010a) is titled Effects of high-temperature heat treatment on the mechanical properties of unidirectional carbon fiber reinforced geopolymer composites. They used an unidirectional continuous PAN-based carbon fiber (fiber diameters 6-8 microns) with hand lay-up impregnation (ultrasonic vibration) of 16 layers, polycondensation at 80 °C for 24 h using a vacuum-bag technique. After heat treatment at 1100-1200°C, the composite reaches 234.2 MPa flexural strength and 63.8 GPa Young’s modulus. But the kalsilite/leucite matrix has a high porosity in the range of 30-37 vol %. In order to overcome this drawback, He et al. (2010b), Improvement of high-temperature mechanical properties of heat treated Cf/geopolymer composites by Sol-SiO2 impregnation, treated the post-heated composite with Sol-SiO2 solution under vacuum to seal the cracks and pores formed during heat treatment. The strength of the composite reached its maximum value of 425.1 MPa at 900 °C. All previous research papers dealt with high-tech performances, targeted to aeronautical, automobile and aerospace applications. They also used either fabrics or unidirectional fiber tapes to achieve highest strength. These materials require either very fluid geopolymer matrix for impregnation associated with vacuum bagging. Yet, the majority of published geopolymer matrices do not easily penetrate in between the fibrils. Our experience shows that in order to achieve optimal impregnation, the dimension of the minerals and geopolymer particles must be smaller than the diameter of a single fiber. There is a lack of research carried out in this domain. To overcome this difficulty Bortnovsky and his team developed their own filament winding equipment. Their paper (Tran et al., 2009) is titled Effect of curing temperature on flexural properties of silica-based geopolymer-carbon reinforced composite. This technique facilitates the impregnation of viscous matrices. They used 24K carbon fiber filaments and got a geopolymer-carbon-fiber composite containing approximately 37 wt. % or 40 vol. % of carbon fiber and reached flexural strength in the range of 570 MPa. But, for more low-tech, low-cost applications, carbon fiber is too expensive. Several papers are presenting geopolymer composite materials involving basalt fibers. For example, Welter et al. (2015) paper describes the Evolution of the Fibre-Matrix Interactions in Basalt-Fibre-Reinforced Geopolymer-Matrix Composites after Heating. The upper temperature limit is in the range of 600 °C due to softening of the basalt fiber. The flexural strength measured at room temperature is in the range of 194 MPa for a geopolymer matrix of the poly(sialate-siloxo) type. This relatively high strength was obtained with unidirectional basalt filament tapes, made individually by impregnation and hand lay-up. This is not the case in several studies. With short or woven fabrics, due to the high viscosity of the poly(sialate-siloxo) matrix, the method of fabrication of the composite panels is simplified to a minimum. It involves first poring the geopolymer matrix in a mold and then applying alternating layers of geopolymer and 2-D plain weave / chopped strand basalt fabrics and mats. It is hoped that vibration is helping the infiltration of the matrix into the reinforcing matrix. One obtains weaker flexural strength, in the range of 40 MPa, like in the study described in Ribero and Kriven (2016) paper titled Properties of Geopolymer Composites Reinforced with Basalt Chopped Strand Mat or Woven Fabric, J. Am. Ceram. Soc., 99  1192–1199 (2016). The fiber content varies largely, from as low as 0.5 wt.% for short fibers to 20% for mat or felt. The application fields cover super high-tech/ high cost heat resistant technology down to low-tech / low-cost eco-concrete. It is therefore difficult to draw any conclusion from one field to the other. They must be outlined independently, best by reinforcement categories. Let us start with the "most exotic" one, namely the reinforcement with graphene nano-sheets. The Chinese research group from Harbin Institute of Technology published two papers. Both are dealing with the in situ fabrication of the graphene reinforcement. The first by Yan et al. (2015) is titled In situ fabrication and characterization of graphene/geopolymer composites. Graphene offers considerable potential as nano-filler in the fabrication of geopolymer materials. Homogeneously dispersed graphene reinforced geopolymer castables were easily and simply prepared through in-situ reduction of graphene oxide (GO) in the alkaline silicate solutions. The in-situ graphene oxide reduction occurs at 60 °C for 72 h. The as-obtained graphene is uniformly dispersed and added to metakaolin, ultrasonically mixed and polycondensed at 60 °C for 7 days. The final amorphous geopolymer matrix is of the type poly(sialate-siloxo). It is unaffected by the homogeneously dispersed graphene yet strong interfacial bonding is observed. As a result, the fracture toughness of the composite with 1 wt% graphene was improved by 17% compared with the plain geopolymer. This seems very low but the real value of this graphene reinforcement appears in the second paper of the team, namely in Yan et al. (2016) Crystallization kinetics and microstructure evolution of reduced graphene oxide/geopolymer composites. Indeed, when followed by a heat treatment, K-poly(sialate-siloxo) geopolymer is transformed into high-temperature stable leucite ceramic. The flexural strength at room-temperature for the graphene- K-poly(sialate-siloxo) geopolymer composite is in the range of 10-15 Mpa. After heat -treatment at 950 °C for 30 minutes, it reaches 75 Mpa. Yet, it is not stable at this temperature. For longer heat-treatment time, the strength decreases due to the oxidation of the graphene nano-sheets. Lin et al. 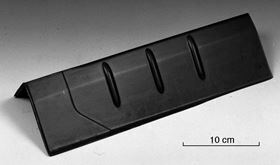 (2008) used a sheet-like carbon fiber preform made of short carbon fibers (2, 7 and 12 mm, respectively) as starting materials to strengthen a geopolymer of the type poly(sialate-siloxo). It is titled Effects of fiber length on mechanical properties and fracture behavior of short carbon fiber reinforced geopolymer matrix composites. The composite reinforced by the carbon fibers of 7 mm in length shows a maximum flexural strength, which increases from 16.8 for the plain geopolymer to 91.3 MPa . The same group studied the advantages of short SiC fibers. In Yuan et al. (2016) paper, SiC fiber reinforced geopolymer composites, part 1: Short SiC fiber, the effects of fiber contents and lengths on the microstructure and mechanical properties of the geopolymer composites were investigated. When fiber content was 2.0 vol% with length of 5 mm, the composite obtained the highest flexural strength, in the range of 94 MPa, 5.6 times higher than for the neat geopolymer. An interesting development of our previous technology for geopolymer tooling was introduced by Ó Brádaigh et al. (2011), Electrically-Heated Ceramic Composite Tooling For Out-Of-Autoclave Manufacturing Of Large Composite Structures. This paper describes the development of electrically-heated ceramic composite tooling, aimed primarily at the manufacture of large composite structures, for aerospace or for wind energy. The tooling is designed to operate at temperatures up to 300 °C, but has the potential to be used at temperatures up to 500 °C and above. The ceramic material is a poly(sialate-disiloxo) geopolymer reinforced by carbon fibers and thermoplastic polymers, and laid up with embedded electrical heaters. The geopolymer and reinforcing layers are laid up by hand at room temperature, on a standard pattern and cured initially to 60 °C, followed by a free-standing post-cure, in stages to approximately 400 °C. The tooling is lightweight, strong and durable, and has a low coefficient of thermal expansion. They developed a tooling with incorporated heating devices to manufacture 12.6 meter long glass-fiber/epoxy and glass-fiber/PBT wind turbine blades for wind mill energy production. Steel fiber Portland cement concrete is a well-known composite material which provides post crack strength to concrete. There are several papers dedicated to steel fiber reinforcement of geopolymer cements / concretes, but the majority of them do not bring new knowledge. We selected the paper by Ranjbar et al. (2016) titled Mechanisms of interfacial bond in steel and polypropylene fiber reinforced geopolymer composites. They studied the effects of wettability, chemical characterization and nanometric roughness of polypropylene and micro steel fibers (MSF) with 0.5, 1, 2, 3 and 4 vol.% for each type of fibers, on a fly ash-based geopolymer paste. The results show that micro steel fiber MSF has a strong contact with the geopolymer paste since it tends to behave as a hydrophilic material. This behavior provides significant improvement in energy absorption and flexural strength; on the other hand, polypropylene fiber led to fiber-matrix debonding due to its hydrophobic characteristics, weakening the mechanical performances of the composites. MSF reinforcement with 3 vol.% provides 35 MPa flexural strength, to be compared with 8 MPa for polypropylene fiber addition. Basalt has much better chemical resistance than that of glass fiber, especially in the presence of strong alkalis. Basalt in the form of fibers has been used as a reinforcement phase to geopolymers, exhibiting enhancements in mechanical strength compared with pure geopolymer. We already cited 2 papers in the section dedicated to Geopolymer-fiber-composites, namely Welter et al. (2015) for unidirectional fiber and Ribero and Kriven (2015) for short and chopped strand mat. In this section, we selected an interesting topic dedicated to the reinforcement of foamed (expanded) geopolymer. The paper by Masi et. al (2015), The effect of organic and inorganic fibers on the mechanical and thermal properties of aluminate activated geopolymers, presents the mechanical and microstructural properties of basalt fiber and poly(vinyl-alcohol) PVA fiber (see next section) reinforcement for foamed fly ash-based geopolymer. The density of the material is in the range of 1 g/cm3, down from 2g/cm3 for the non-expanded material. Low density and thermal resistant materials used as insulating panels are known to be susceptible to damage due to their poor flexural strength. The results highlight that the presence of 1 vol. % of poly(vinyl-alcohol) PVA fibers greatly increased the flexural strength of the geopolymer foam from 5.5 MPa up to 14 MPa at room temperature, while for 1 vol. % basalt fiber, the flexural strength does not change. But the behavior at higher temperatures is different. PVA fiber reinforced foamed geopolymers exhibited flexural strengths in the range of 14 MPa until the samples were exposed to temperatures greater than 150 °C. Temperatures of 200 °C and 250 °C caused a decrease in values of flexural strength of 35% and 70%, respectively. On the other hand, as the melting point of basalt is 1000 °C, a range of higher temperatures was used for sample exposure prior to the three points bending test. It was observed that the flexural strength of 5.5 MPa did not change significantly in the range of 600 °C and 700 °C from the samples tested as cured. However, beyond 700 °C the flexural strength values nearly doubled, reaching 10 MPa. This improvement in flexural strength is likely caused by the sintering of the geopolymer paste leading to an improved fiber-matrix adhesion. As the foamed samples reinforced with PVA or basalt fibers exhibited comparable density values, it could be stated that the nature of the fibers added did not influence the performance of foamed geopolymers under simulated fire conditions. These are acronyms for poly(vinyl-alcohol) PVA, poly(lactic-acid) PLA, poly(acetal) POM. Poly(vinyl-alcohol) PVA fiber Portland concrete is a well-known composite material which provides post crack strength to concrete. There are several papers dedicated to PVA fiber reinforcement of geopolymer cements / concretes, but the majority of them do not bring new knowledge. We have already discussed its property in comparison with basalt fiber. The paper by Zhang et al. (2008), Impact properties of geopolymer based extrudates incorporated with fly ash and PVA short fiber, presents the addition of 1-2 vol.% of PVA short fibers into a metakaolin/fly ash-based geopolymer mortar, manufactured by extrusion technique. The extrusion technique enables intractable substances to be shaped into various products of complicated cross-section with minimal water content, which is critical in developing high strength, low permeability and excellent durability of geopolymer products. The PVA fiber length is 6 mm with an average diameter of 14 microns. The experimental results show that the addition of 1 vol. % PVA fiber increases greatly the ductility and impact resistance of the hardened geopolymer mortar. The poly(acetal) POM fiber used in the paper by Zhao et al. (2016), Fabrication, mechanical performance and tribological behaviors?of polyacetal-fiber-reinforced metakaolin-based geopolymeric composites, is still in the development phase. It is not commercialized so far. According to the authors, POM is one of the most important engineering thermoplastics. The addition of 1 wt.% POM fiber to a poly(sialate-siloxo) geopolymer provides higher strength associated with a new property: low friction coefficient. The mechanical and tribological properties of the resulting composites were evaluated, and the morphology and microstructure were investigated. The POM fibers provided significant mechanical reinforcement for the metakaolin-based geopolymer. The composites were optimized for flexural and compressive strength with respect to 1 wt.% fiber content and 6 mm fiber length. Compared to unreinforced geopolymer, the composites obtained an optimum improvement in flexural strength up to 11 MPa compared to 4.5 MPa for plain geopolymer, and compressive strength up to 62 MPa compared to 49 MPa. The POM-geopolymer also achieved a considerable reduction in the friction coefficient and abrasion loss rate. Such an enhancement of tribological performance is ascribed to the formation of self-lubricating transfer films between the contact surfaces of composites against the steel counterpart. According to the authors, the improved mechanical strength, enhanced tribological properties, environmentally friendliness and relatively low cost make these developed POM geopolymeric composites potentially attractive for a number of construction and civil engineering applications. The paper by Okada et al. (2011), Capillary rise properties of porous geopolymers prepared by an extrusion method using polylactic acid (PLA) fibers as the pore formers, does not deal with the addition of fiber for reinforcement purpose. The PLA (polylactic) fiber is used as a pore former in order to increase the capillarity and porosity of poly(sialate-siloxo) cement / concrete, similar to so-called "lotus ceramics". Indeed, the high surface temperature of building materials in summer sunshine can efficiently be lowered by wetting these porous materials to exploit their capillary rise of water which then evaporates. The effectiveness of this passive cooling has been confirmed by observation of cool areas in the vicinity of many lotus ceramics, suggesting that these materials are good candidates for counteracting heat island effects. The porous geopolymers were prepared by kneading PLA fibers of 12, 20 and 29 micron diameter into the geopolymer paste, at fiber volumes of 13–28 vol%. The resulting paste was extruded using a domestic extruder, cured at 90 °C for 2 days then dried at the same temperature. The PLA fibers in the composites were removed by alkali treatment and/or heating. The highest capillary rise, i.e. passive cooling effect, was achieved in the porous geopolymers containing 28 vol. % of 29 micron fibers. Any scientist or laboratory technician working with geopolymers learnt to their costs about the high reactivity of cotton dress towards fresh geopolymer resin, binder and cement. Any geopolymer stain remains forever incrusted in the cotton fabric. This is due to the hydrophility of bio-fibers. It is therefore not surprising to find that they are very good candidates for geopolymer reinforcement. The paper by Alomayri and Low (2013), Synthesis and characterization of mechanical properties in cotton fiber-reinforced geopolymer composites, describes a cotton fiber-reinforced fly ash-based geopolymer cement. The alkali resistant cotton fibers have an average length of 10 mm, average diameter of 0.2 mm, density of 1.54 g/cm3 , tensile strength of 400 MPa. In the present study, the optimum compressive strength of the neat geopolymer paste increased from 19.1 to 46.0 MPa after the addition of 0.5 wt.% cotton fibers. However, adding more cotton fibers (0.7 and 1.0 wt. %) led to a reduction in compressive strength. The impact strength of the neat geopolymer paste also increased from 1.9 to 4.5 kJ/m2 after the addition of 0.5 wt.% cotton fibers. Instead of short cotton fibers, the same group, Alomayri et al. (2014), Synthesis and mechanical properties of cotton fabric reinforced geopolymer composites, studied the influence of a higher amount of cotton fibers on the flexural strength. Geopolymer composites reinforced with different layers of woven cotton fabric are fabricated using lay-up technique. Woven cotton fabrics have been impregnated (wet out) with fly ash-based geopolymer paste, stacked, and compressed by a roller to force the paste to penetrate the fabric and to remove most of the trapped air. Useful results have been gathered for composites with various cotton fiber contents (0, 3.6, 4.5, 6.2 and 8.3 wt.%). The composite containing 8.3 wt% woven cotton fibers exhibited the highest flexural strength among all composites. The flexural strength of the composites increased from 8.2 MPa to 31.7 MPa compared to pure geopolymer. There have been no reports in the literature of the use of natural protein-based fibers such as wool as long-fiber reinforcement of a geopolymer matrix. The paper by Alzeer and MacKenzie (2012), Synthesis and mechanical properties of new fiber-reinforced composites of inorganic polymers with natural wool fiber, reports the use of two types of wool (carpet wool and Merino wool) for this purpose, with the aim of producing novel, environment-friendly low-cost composites with improved flexural strength and graceful failure for engineering and construction applications. The mechanical properties of fiber-reinforced composites depend on the fiber-matrix interface, since the strength of such a composite is obtained by transferring the stress between the fibers and the matrix. For this reason, the surface chemistry of the wool fibers and their interaction with the alkaline geopolymer matrix are expected to play an important role in the behavior of the composite. Alkali has a destructive effect on protein fibers even at low concentrations and temperatures; several of the amino acid groups in wool (arginine, lysine, histidine, tyrosine, the terminal amino groups and particularly cystine) rapidly react with alkali. The main degradation reactions of wool in alkaline solution involve the formation of lanthionine by cleavage of the disulphide bridge, releasing free sulphide atoms into the solution. The surfaces of some of the wool fibers used in this study were chemically modified to improve their alkali resistance and reinforcing properties. With average 5 wt% wool fiber content, the flexural strengths are in the range of 8.1 to 9.1 MPa to be compared with 5.8 MPa for the pure geopolymer, and graceful failure, unlike the unreinforced matrix that displays ceramic-like brittle fracture. Interaction between the sulphide linkages of the wool and the aluminosilicate matrix produces a blue-green color in the wool, shown by UV–visible and IR spectroscopy to be related to the formation of the sulpho-aluminosilicate compound sodalite. The same team, Alzeer and MacKenzie (2013), Synthesis and mechanical properties of novel composites of inorganic polymers (geopolymers) with unidirectional natural flax fibers (phormium tenax), studied another bio-fiber, flax. A poly(sialate-siloxo) geopolymer was unidirectionally reinforced with 4–10 vol.% natural cellulose-based fiber, flax phormium tenax. The mechanical properties of the fiber-reinforced composites improve with increasing fiber content, achieving ultimate flexural strengths of about 70 MPa at 10 vol.% fiber content. This represents a significant improvement on the flexural strength of the unreinforced geopolymer matrix (about 5.8 MPa). The composites show graceful failure, unlike the brittle failure of the matrix. Scanning electron microscopy was used to study the morphology of the fiber-matrix regions and a combination of thermogravimetric analysis (TGA) and thermal shrinkage measurements of these composites suggests that despite the formation of microcracks due to water loss from the geopolymer matrix, the fibers are thermally protected by the matrix up to 400 °C. The flax fibers do not appear to be compromised by the alkaline environment of the matrix, suggesting new possible applications for these low-cost simply prepared construction materials. Assaedi et al. (2016) recently published a paper titled Characterizations of flax fabric reinforced nano-clay-geopolymer composites. The target of using flax fiber is to develop ‘environmental-friendly materials’ through utilizing natural fiber reinforcement. This study investigated the fabrication of eco or “green” nano-composites using nano-clay and flax fiber as reinforcement of fly ash geopolymer matrices. The flexural strength of the composites is in the range of 4.5 MPa to about 23 MPa, depending on the quality of the geopolymer matrix. The editors hope this selection will inspire additional, and much-needed, research and standardization on the preparation, manufacture of reinforce geopolymer composites geopolymers, bearing in mind that industrialization and commercialization already started with the production of several applications, worldwide. Davidovits N., Davidovics M. and Davidovits J., (1988), Ceramic-ceramic composite materials and their manufacture, PCT patent publication WO 88/02741, US patent 4,888,311.? Davidovits J. and Davidovics M., (1991), Geopolymer: Ultra-High Temperature Tooling Material for the Manufacture of Advanced Composites, Proc. 36th Int’l SAMPE Symposium, 1939–1949 (see Technical Paper #9).? Hammell J.A., Balaguru P.N., Lyon R.E. and Davidovits J., (1999), Influence of reinforcement types on the flexural properties of Geopolymer composites, Geopolymer’99 Proceedings, pages 155–164.? Joseph Davidovits, Chapter 21: Geopolymer Fiber-Composites, in Geopolymer Chemistry and Applications, 2nd ed. 2008, 3rd ed. 2011, 4th ed. 2015, Geopolymer Institute, ISBN 4th ed. 9782951482098. In the Library at http://www.geopolymer.org/category/library/technical-papers/. - Technical Paper # 1 Fire resistant aluminosilicate composites. - Technical Paper #2 Reinforced Concrete Beams. - Technical Paper #9: Ultra-High Temperature Tooling Material for the Manufacture of Advanced Composites. - Technical Paper #12: Geopolymers: Inorganic Polymeric New Materials. Alomayri T., Low I.M., (2013), Synthesis and characterization of mechanical properties in cotton fiber-reinforced geopolymer composites, Journal of Asian Ceramic Societies 1, 30–34. Alomayri T., Shaikh F.U.A., Low I.M., (2014), Synthesis and mechanical properties of cotton fabric reinforced geopolymer composites, Composites: Part B 60, 36–42. Assaedi H., Shaikh F.U.A., Low I.M., (2016), Characterizations of flax fabric reinforced nano-clay-geopolymer composites, Composites Part B 95, 412-422. Hammell J.A, Balaguru P.N, Lyon R.E, (2000), Strength retention of fire resistant aluminosilicate–carbon composites under wet–dry conditions, Composites: Part B 31, 107–111. He P., Jia D., Lin T., Wang M., Zhou Y., (2010a), Effects of high-temperature heat treatment on the mechanical properties of unidirectional carbon fiber reinforced geopolymer composites, Ceramics International 36 (2010) 1447–1453. He P., Jia D., Lin T., Wang M., Zhou Y., (2010b), Improvement of high-temperature mechanical properties of heat treated Cf/geopolymer composites by Sol-SiO2 impregnation, Journal of the European Ceramic Society 30 3053–3061. Mills-Brown J., Potter K., Foster S., Batho T., (2013) The development of a high temperature tensile testing rig for composite laminates, Composites: Part A 52, 99–105. Lin T., Jia D., He P., Wang M., Liang D., Effects of fiber length on mechanical properties and fracture behavior of short carbon fiber reinforced geopolymer matrix composites, Materials Science and Engineering A 497 (2008) 181–185. Masi G., Rickard W. D. A., Bignozzi M. C., van Riessen A., (2015), The effect of organic and inorganic fibers on the mechanical and thermal properties of aluminate activated geopolymers, Composites Part B 76 218-228. Okada K., Imase A., Isobe T., Nakajima A., (2011), Capillary rise properties of porous geopolymers prepared by an extrusion method using polylactic acid (PLA) fibers as the pore formers, Journal of the European Ceramic Society 31, 461–467. Ranjbar N., Talebian S., Mehrali M., Kuenzel C., Metselaar H. S. C., M. Z. Jumaat, (2016), Mechanisms of interfacial bond in steel and polypropylene fiber reinforced geopolymer composites, Composites Science and Technology 122, 73-81. Yan S., He P., Jia D., Yang Z., Duan X., Wang S., Zhou Y., (2015), In situ fabrication and characterization of graphene/geopolymer composites, Ceramics International 41, 11242–11250. Yan S., He P., Jia D., Duan X., Yang Z., Wang S., Zhou Y., (2016), Crystallization kinetics and microstructure evolution of reduced graphene oxide/geopolymer composites, Journal of the European Ceramic Society 36, 2601–2609. Yuan J., He P., Jia D., Yan S., Cai D., Xu L., Yang Z., Duan X., Wang S., Zhou Y., (2016), SiC fiber reinforced geopolymer composites, part 1: Short SiC fiber, Ceramics International 42, 5345–5352. Zhao W., Wang Y., Wang X., Wu D., (2016), Fabrication, mechanical performance and tribological behaviors?of polyacetal-fiber-reinforced metakaolin-based geopolymeric composites, Ceramics International 42, 6329–6341. Giancaspro J.W., Balaguru P.N. and Lyon R.E., (2004), Fire protection of flammable materials utilizing geopolymer, SAMPE Journal, 40 (5), pp. 42-49. Hammell, J.A., Balaguru, P.N., and Lyon, R.E., (1998), Influence of Reinforcement Types on the Flexural Properties of Geopolymer Composites, SAMPE International Symposium, 43, 1998.? Lyon R.E, Foden A.J., Balaguru P.N., Davidovits J. and Davidovics M., (1997), Properties of Geopolymer Matrix-Carbon Fiber Composites, Fire and Materials, 21, 67–73. Nazier, M., Giancaspro, J., Balaguru, P., (2002), Strengthening of masonry walls with high strength fibers and inorganic matrix International SAMPE Symposium and Exhibition (Proceedings), 47 II, pp. 919-928. Ó Brádaigh, C. M., Doyle A., Doyle D., Feerick P.J., Electrically-Heated Ceramic Composite Tooling For Out-Of-Autoclave Manufacturing Of Large Composite Structures, Paper presented at SAMPE 2011, Long Beach, USA, May 2011, available on line at http://hdl.handle.net/10379/3542 (Downloaded 2016-05-18). Tran D.H., Kroisová D., Louda P., Bortnovsky O., Bezucha P., (2009), Effect of curing temperature on flexural properties of silica-based geopolymer-carbon reinforced composite, Journal of Achievements in Materials and Manufacturing Engineering 37/2, 492-497. M. Welter, M. Schmücker, K.J.D. MacKenzie, (2015), Evolution of the Fibre-Matrix Interactions in Basalt-Fibre-Reinforced Geopolymer-Matrix Composites after Heating, J. Ceram. Sci. Tech., 06  17-24.